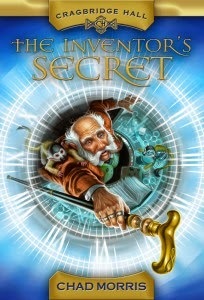 In The Inventor's Secret, the fifth and final Middle Grade Whitney Award finalist, there's a fun, fascinating, futuristic invention around every corner, but almost to the extent that they overshadow the characters and story. Abby and her twin brother Derick have been admitted to the prestigious school Cragbridge Hall. While Derick fits right in with the other brilliant and overachieving students, Abby feels out of place and just plain ordinary, especially since she knows her application was initially rejected before her grandfather, the founder of Cragbridge Hall and a famous inventor, intervened. Unfortunately, her roommate Jacqueline discovers this nepotism and refuses to room with her, locking her out of their dorm room the first night at school. The other girls likewise reject her, since they all had friends who didn't get in to the school and blame her for taking a spot from a more deserving student. Finally one girl, Carol, befriends her and life starts looking a bit brighter. And then her grandfather is kidnapped, her parents go missing, and only Abby and Derick have the clues to rescue them. I can't quite put my finger on what felt off about the book. I liked it. It was entertaining for sure, the inventions were creative, there was adventure and time travel and intriguing puzzles to figure out. But I was annoyed that Abby thought boys acting in women's roles in Elizabethan England was "gross" and I was a little taken aback by how consistently vicious Jacqueline's bullying of Abby was, though Abby triumphs in the end. The characters in the book, with the possible exception of Abby and Derick, seemed fairly flat, like two-dimensional stock characters. There were a couple who started out antagonistic toward Abby and Derick and then suddenly flip-flopped and were on their side and that's just an awfully convenient plot device. Or perhaps it's because I sympathized a bit with the bad guy, Charles Muns. Don't get me wrong, he's a thoroughly evil character, but I kind of buy his argument that if you could go back and stop Hitler that would be a good thing. And while I can understand Dr. Cragbridge's insistence that "the fabric of society could change" and that if society didn't have tragedies to learn from, we would be less humble and simply make even bigger mistakes, there seems to me to be a moral imperative to prevent death and pain when possible. Yes, messing around with the past would have serious, world-changing ramifications, but I'm not sure that "tragedies are where heroes are made...tragedies help us forget lesser problems and come together" is a comforting statement to those who lose loved ones. The Inventor's Secret is another one of those books by an LDS author that has a Mormon image tossed into a random scene, kind of an Easter egg for the LDS readers. A painting on the wall of the school depicts Joseph Smith having an operation on his leg as a small boy and notes that he "grew up to be the founder of a new American religion."